“New broadcast law gives regulators broad powers to revoke TV licenses. Gala TV, a rare critical broadcaster, faces array of government pressures,” international media watchdog Committee to Protect Journalists says in its global survey of attacks on Press Freedom published on Tuesday. Below are extracts from the report’s section covering Armenia. The most drastic step occurred in June when parliament passed and the president signed into law amendments to the Law on Television and Radio that tightened control of the country’s influential broadcast media, according to local and international press reports. The government tried to deflect attention from the restrictive amendments by embedding them into a package of measures meant to move radio and television stations from analog to digital signals. The amendments enable government regulators to grant or revoke licenses without explanation, as well as impose programming restrictions that would confine some stations to narrow themes such as culture, education, and sports, according to news reports. Analysts said the changes would provide the government legal cover to keep the popular news outlet A1+ off the air. Armenian authorities revoked A1+’s broadcasting license in 2002–after the station aired critical news reports about President Robert Kocharian–and then denied a dozen subsequent license applications. The government has essentially ignored a June 2008 ruling by the Strasbourg-based European Court of Human Rights that said authorities improperly revoked the A1+ license without adequate explanation. Another amendment stipulates that only one digital television license would be issued for each of the 10 regions outside the capital. The restriction was seen by some as a means to silence Gyumri-based Gala television, the one domestic station that continued to broadcast criticism of the government. 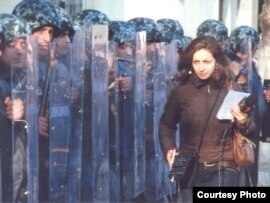 Officials in Gyumri, the country’s second-largest city, escalated their campaign of harassment against Gala during 2010. Tax officials froze the station’s bank accounts, customs officers seized equipment bound for the station, and authorities pressured businesses to stop advertising on the station. Authorities have harassed the station since 2007 in retaliation for broadcasting speeches by Levon Ter-Petrossian, the former president turned opposition leader. One positive legal change occurred in May when parliament amended the penal and administrative codes to decriminalize defamation. Sargsyan later signed the measure, although it was considered largely symbolic because the law was rarely used to harass journalists and authorities retained many other levers of influence. Throughout the year, police officers routinely harassed, assaulted, and arrested journalists, according to local press reports and media analysts. Prosecutors regularly colluded in this practice by failing to investigate police officers, even filing charges on occasion against journalists who protested abuses, CPJ research showed. This entry was posted in Armenia, Politics and tagged Broadcasting, Committee to Protect Journalists, European Court of Human Rights, GALA TV, Gyumri, Levon Ter-Petrossian, Press Freedom, Robert Kocharyan by Observer. Bookmark the permalink.